This walk explores the south-west flanks of the massif - les Bannettes and the Rocher de Lorzier (map). It only reaches a maximum height of 1790 m, but as with other routes on the Grande Sure most of the walking is an absolute delight. It also links up nicely with the Pas de l'Aronde walk, allowing one to develop a fuller understanding of the geography of the area. The walk starts from Monastère de Chalais (950 m, grid ref. UTM 31T 70991 50189), a Dominican convent which is approached from Voreppe. The road forks as it approaches the convent - the left branch leads to a car park behind the buildings, where there is an information board and lots of sign posts. The walk starts on a forest track heading south which after a few minutes morphs into a gradually descending path. It's always nice for muscles to be able to warm up gently on a walk in Chartreuse, rather than having to slog immediately up an horrendous incline. After half an hour there is a junction, where, in common with the rest of the walk, you take the left hand option. This takes you onto a pleasant traverse beneath some cliffs before reaching the "la Cheminée" - a rake which ascends steeply through the crags at the end of the ridge. There is a large drop and impressive views to the right but it is well protected with sturdy guard wires. Beyond the chimney, the path crosses over the ridge and drops down through a forest rich in holly trees to the first of several junctions where the left hand route is selected each time (all other roads seem to lead to Mont St. Martin!). A forest track is somewhat tediously followed up-hill for half an hour or so, to where is rises steeply through an old meadow now taken over by raspberry canes. From this point the track seems to have been used for transhumance rather than forestry, and the walking becomes more interesting. Half an hour after leaving the meadow, the ridge is reached and the forest gives way to flowery grasslands, juniper, and distant prospects as we emerge onto the upland pastures of les Bannettes to reach a fence, where a path turns off for the summit of the Rochers de Chalves. A few metres further on there is a little knoll on the left which is a splendid place for lunch and to recover from the grind of the last hour or so. It takes about three hours to reach this point from the car park. 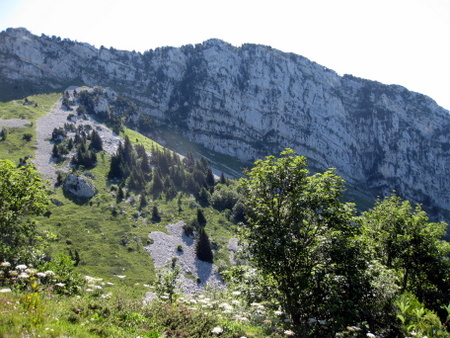 Below, to the west, there is a fine view of the Isère river as it sweeps round the northern tip of the Vercors, and ahead the north the cliffs of the Rocheur de Lorzier can be seen to fine effect. The path continues easily towards the Chalet des Bannettes, a small unwardened refuge tucked under the cliffs around which cattle can often be found grazing. The next target is the Col d'Hurtiéres, which is one of the two cols which divides the Grande Sure internal valley into three sections. Continuing past the cabin, a valley comes into view on the right with views of Charmant Som peeping through, and once through another fence, there is a junction with the path coming up through from the col de la Charmette. We keep going, rising steadily through the pasture, and eventually reach the col (1740 m), some 30 minutes after leaving the refuge, where we are presented with a fine view of the southern flanks of the Grande Sure. Turning left up the fence, the Cheminée du Lorzier is reached within five minutes. This is a disconcertingly steep descent through the cliffs down a gully. It requires the use of hands, but it is easy enough (Difficulty 2). Once down the gully, the path sweeps down a flowery hillside onto a forested narrow ridge before arriving at the abandoned pastures of Charminelle (1505 m). This is a major cross-roads, and we turn left down the abandoned pasture into the shade of the forest, where a source is passed after five minutes. After a further 20 minutes the sounds of a river can be heard, and before long the path is running above the Charminelle stream. This is a superb section of path, with some wonderful flowers, outstanding viws of the cliff above, and the stream cascading over some impressive waterslides below. The path crosses over the stream three times in the course of the next 30 minutes, the last of which is adjacent to a splendid waterfall with tufa covered walls. The stream disappears from sight, and the path crosses a subsidiary stream, which drops steeply into a gorge, and follows a narrow protected path, from which there are dramatic views of the Charminelle stream plunging some 100 metres or so into the gorge. Once beyond this, 20 minutes of easy going leads to a junction with a forestry track at the Abri de la Roize (1141 m), another small unwardened refuge. The car park may be found a further 20 minutes down the track.